I’ve lived with Noble for a bit over a year now and, without spending much time teaching him anything, I can already tell that the boy is going to keep me on my toes! He is sharp as a tack, always watching what’s going on … and he KNOWS when it’s his turn! Noble is generally a very calm fellow. He likes his fun, and he loves to rough house with his uncle Java – but he’s otherwise very laid back. New things interest him, but don’t disturb him. Loud machines, sudden noises … all just lead to a curious but relaxed look. I recently got the riding mower out, for the first time this season. Miss Tally, who grew up around the darned thing, was whirling around at the sight and sound of it. Noble gave it one look, then went back to playing with Java. I love that about him! But, for all his laid back nature, he knows when it’s his turn and he is NOT to be denied! On days when I’m home, his turnout time comes after the adult horses have all been worked. All morning he’s hanging out, watching the activity, playing nippy-face with Java … the kicked-back kid. However, the instant we put the last horse away, he begins demanding his due! up on it. If that does not result in his halter being picked up, then he will back up and let fly against the stall wall … bang, bang, bang! He’ll then come forward and check on our progress. When I’m feeling particularly ornery, I stand and watch the show. He looks all the world like a teenage boy having a tantrum! With each fit, he stops to check the effect he’s having. I can see wheels turning as he ponders his next move. Eventually, at a moment when he’s quiet, I pick up his halter – and he KNOWS when it’s HIS halter! On rare occasions, he gets excited and begins to jump around – but mostly he knows that the only way he gets the halter on is to stand still, with his head over his door. Any wiggling results in the halter dropping and my turning away … and that ensures that on the next attempt I will have a stone-still colt! He learned that lesson in just a couple of repetitions … but all teenagers forget themselves at some time or another! Once the halter is on, he’s back to being the prince of the barn … calm and generally dignified and mannerly. What I learned this weekend is that it really is about “his turn”. I knew that he made the association with the timing, but I always thought it was about the turnout time. However, on one occasion this weekend, we could not turn him out until later. 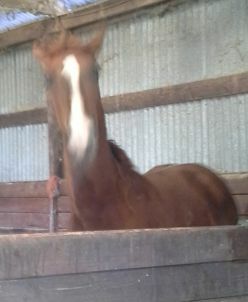 Instead, when “his turn” came around (and he was particularly demonstrative), I groomed him (he loves a good scratch!) 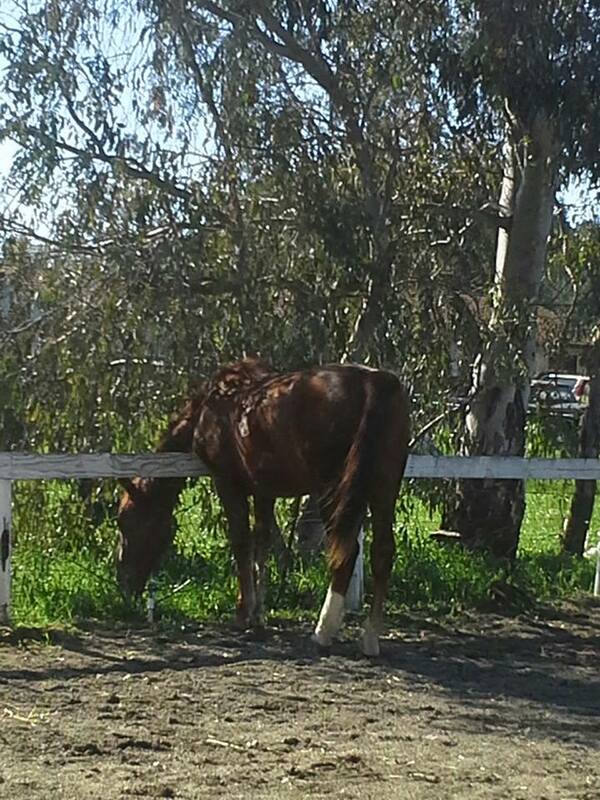 and took him out to graze on the line. He was perfectly well mannered, and when our time was up, he calmly followed me back in. No sign of the whirling dervish of just a short time before! Yes, this boy will be a challenge – but he’s just the kind of challenge I love: a smart horse that I have to keep things fresh for. Last Friday I finally got the results of the CT scan, and the cause for the still swollen foot … drum-roll please … I have several chip fractures. Actually, this is probably down to Noble, too. In a typically clumsy teenager move, back in mid-December, he came down hard on my foot while turning on a patch of uneven ground. Likely scenario seems to be that the fractures happened then and just aren’t stabilized yet. Surgery is an option, but not recommended, since I’m mostly getting on all right. So, good shoes, a balance of activity, rest and ice … and “tincture of time” is the prescription (seriously, the quote is direct from the podiatrist!). Better than surgery and a cast, so I will try to be a “good girl” … that’s all I can promise! This entry was posted in My Journey and tagged Noble, smart horse, swollen foot, temper tantrum. Bookmark the permalink.